Great Bible for teens, this gives them a little more in the way of commentary as well as meaningful thoughts on the Word of God. Beautiful Hardcover Bible. My 13 year old son has claimed this one and carries it as his main Bible. I love that is is a great cover for Teens, not childish like many of the kids Bibles. Study Bibles are so helpful at helping the teen explore some specific verses as well as applying them to their own lives. This innovative edition of the New International Version helps young readers, ages 13-16, face their questions head on and build a steadfast foundation for their faith. With the Rock Solid Bible, teens discover constant and concrete truths rooted in the unchanging love, guidance, and promises of God. Unshaken God that points out God’s amazing and unyielding attributes. In addition, readers will find easy to understand apologetics, reading plans, hundreds of call-outs, eight pages of full-color maps, Bible book introductions, and many other insightful features to help teens grapple with big questions about the world, their futures, and their faith. 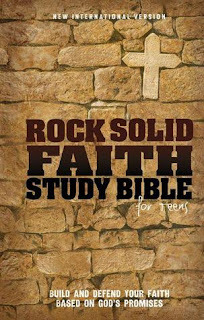 Scheduled to release in August 2012, Zondervan plans to provide the Rock Solid Faith Study Bible for Teens in three printed formats—a hardcover ($29.99) and two Italian duo-tone leather covers ($44.99)—as well as an EBook version ($14.99). It’s the perfect gift for every teen whose heart and life needs reassuring in the midst of our disturbing times. 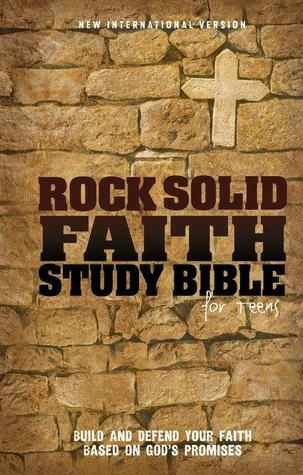 You can find the Rock Solid Faith Study Bible for Teens at your favorite bookstore or at Zondervan.com.